Container storage is still a messy, embryonic field of IT. Rather than a single point of convergence, the storage and containers vendors are rolling out their own solutions. The good news that we are seeing solutions is somewhat mitigated by the bad news that there are rather a lot of them, and they have different APIs and functions. 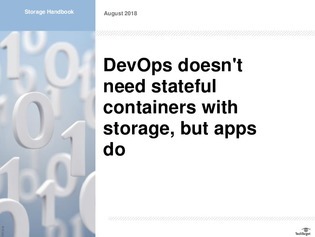 This guide will help you navigate the container storage arena, as persistent storage makes the stateless environment work for end-user apps, not just developers. Read on to see the persistent storage vendors taking center stage, learn why Docker storage and virtual storage requirements differ, and more.